was created during the years 1996 - 1998 by the Bil- och Teknikhistoriska Sällskapet through a co-operation established with The Foundation Bertil Lindblads Bil- och Teknikhistoriska Samlingar. Traditions are alive in this fascinating Museum. The small city of Köping is an industrial town with proud traditions. The mechanical works, named after the city - Köpings Mekaniska Verkstad (KMV) – were founded in 1856. Already in 1926 they began manufacturing gearboxes for AB Volvo. 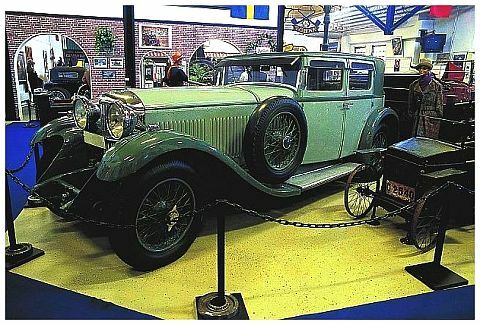 In an industrial estate, where once the mechanical works that took its name from the city - Köpings Mekaniska Verkstad - were located is today a fascinating automotive and technological Museum. Here we treasure the heritage of some of Sweden's most devoted automobile historians, Bertil Lindblad and Curt Borgenstam. Here are famous cars and legendary marques, such as Bugatti, Voisin and Panhard-Levassor as well as immortal classics from Cadillac and Bentley, plus a large number of motorcycles, automobilia and items from our technological heritage. In our exhibition, you'll also find vehicles on loan from private collectors and enthusiasts. We also have other interesting displays, like the 1920's workshop, where a Volvo ÖV 4 from 1927 is waiting for loving care, and many more things related to historic vehicles. A special exhibit of Volvo gearboxes and transmissions will be found upstairs in the Museum. The factory in Köping has been a part of the Volvo group since 1942. - traditions are indeed alive here in Köping. You can mail us for more information. Closed over Swedish Midsummer Days. Groups can pre-book throughout the year. We reserve the right to temporarily alter opening hours and also that exhibited vehicles may change from time to time. In the Museum Reception Area you’ll find a Coffee Shop, as well as a Book and Souvenir Shop.